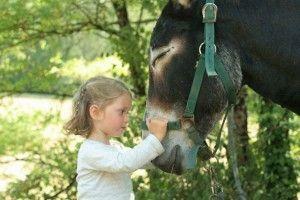 In therapy, the horse is a living facilitator between the patient and the therapist or trainer. Its presence is calming, brings up emotions, reactions, questions, and facilitates dialogue. It is an excellent ally for the therapist and trainer. Equitherapy is the use of horses, ponies or donkeys with patients who face psychological, psychosocial, mental, behavioural and/or physical difficulties. It can be used with many people of various ages and suffering from very different handicaps or difficulties. The horse exists in all civilisations as well as within the memory of all peoples. It is imbued in mystery, linked trough mythology to the natural elements, and harks back to very deeply set cultural tenets. The horse represents strength, power and speed but also freedom and free will. It carries our imagination to the places that have made up our landmarks as adults. This mythical aspect is necessary to forge any human being, and is an integral part of people’s development. The horse has always walked by man’s side, serving him. Linked with man’s evolution, the horse has in turn been a means of transport, a means of war, a means of work, with this symbiosis being based on the relationship between man and horse. What the horse has brought humanity has been acknowledged since ancient times. Already, in the 5th century BC, the philosopher Xenophon had grasped the interaction between man and horse: “The horse is a good master, not just for the body but also for the spirit and the heart”. In his 1751 encyclopaedia, Diderot also praised horsemanship, stressing that its practice was the best possible means of strengthening weak health. Horse therapy first saw the light in Norway and Denmark in 1943, but it did not reach France until 1962 when a physiotherapist, Hubert Lally, tried rehab using horses for the first time. These activities, which have been developed internationally and across continents, are seeing ever greater use in France in areas as diverse as education, care, sports and leisure. They are very widely used with groups that have difficulties integrating, within hospital groups (mainly psychiatry, child psychiatry, and rehab) or medico-social welfare). 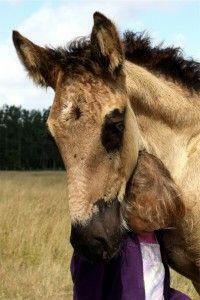 The therapeutic aspect, known as equitherapy, meets and follows a care-related protocol. This is most often remedial, both physically (functional rehab) and psychologically (psychotherapeutic). It can be carried out on a ridden horse or not, generally on a one-to-one basis, in connection and with reference to an inter-disciplinary support project put in place by the person concerned. Examples would include learning to walk again, spinal and back rehab, and psychotherapy. In terms of specialised education, such practices are part of individual support projects in environments related to medico-social welfare or juvenile delinquency, such as child protection services or integration. 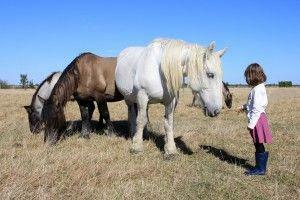 These activities, through or with horses, provide support to bring to fruition rehab projects. 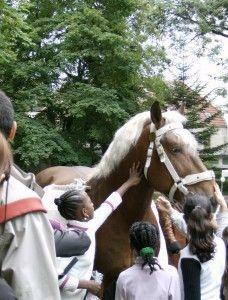 The horse and its environment become the facilitators within the educational activities. Examples include learning and applying rules and the law, regaining self-confidence, and understanding how to relate to others. – Social: In this case, the horse has a special position with regard to certain people, most often in relation to locations or places where they are on an ongoing basis. It paces throughout the year the daily life of the troubled, unwell or handicapped person. In such cases, the horse can actually be put to work or not. Examples include breeding, driving, hacking etc. – Professional: This works through professional integration in the trades that are either closely or distantly linked to horses. The young people and adults drawn to it are strongly committed. These, like all situations leading to work, relevant or not, require a commitment, work-linked training, a follow-up, and mentoring. The sports and leisure aspect is the one that best represents current equestrian and horse-riding related practices, and is adapted to the wide range of practicing audiences. It targets equestrian-related learning and skillsets with the goal of developing a physical and leisure activity which brings to people the qualities of any sport, relaxation or leisure-related activity. Of special note within these activities is non-riding activities such driving which is more accessible and more of a group activity. The aim of equithereapy is not strictly to improve horsemanship, but the relationship with the horse, which will act as the driving force of the therapy. The advantage of working to a therapeutic end with horses comes from them being living beings with their own mind, warm and soft creatures that bring value socially and are well-adapted. They can both carry and transport but, above all, they are non-judgmental and non-intrusive, willing to accept projection, open to old-fashioned dialogue, and worthy of interest and care. All of these qualities make the horse into a facilitator, not a therapist, one who works with the therapist to open up opportunities, and to lead to improvement in a physical, psychological or unease-related condition. Horses make excellent companions that stimulate motivation and communication, improving sensory perception, self-image and self-expression. They make people open-up, come out of their shells, integrate into various foreign environments, and to go beyond their daily limitations. For some people, horses are an amazing tool for integration. It is by using a horse, and through the environment that surrounds this, that the means to rehabilitation, autonomy and integration can be perceived. Psychotherapy which is based on psychoanalytical reflection (mainly Winnicott and the Holding concept). Motor or sensitive rehab which is tested by physiotherapists who use horses as a support mechanism for functional rehab (proprioceptive rehab, coordination etc.). As “educational facilitators” where horses partner educators on projects involving socialisation, upgrading, and regulating behaviour. This type of therapy is carried out by professionals. On the one hand, there are paramedical professionals (trainers, specialist instructors, physicians, physiotherapists, psychomotor specialists, psychologists, nurses etc. ), and on the other equestrian specialists.